What is pulmonary hypertension? If you’ve received a diagnosis, you’ll know it’s serious. It’s different from having regular high blood pressure. Specifically, the diagnosis means you have high blood pressure in your arteries that go from your lungs to your heart. People often describe it as high blood pressure in the heart-to-lungs system. If you’ve got high blood pressure, you likely know the drill: quit smoking, limit alcohol, cut back on salt and sugar, eat more potassium, de-stress and commit to regular activity. Make these habitual, and you’re in good form to keep your blood pressure in the healthy range. But what about pulmonary arterial hypertension (PAH)? What are the causes and risk factors, and what can you do to get it under control? Pulmonary hypertension starts when the tiny arteries in your lungs, called pulmonary arteries, become narrow or blocked, even destroyed. So it’s much harder for blood to flow through your lungs. In turn, that raises the pressure in your lungs’ arteries. No question, your heart works hard to pump blood to all of your body’s organs, tissues and cells. That blood delivers oxygen and nutrients and removes dangerous wastes. But now, with pulmonary hypertension, your heart has to work that much harder to pump blood through those arteries. After a time, the heart muscle weakens. Think of your body like a factory, well-oiled and running smoothly under your management with the right foods, regular activity and other good health habits. Everything is going great until pulmonary hypertension strikes. The pressure continues to mount and the working conditions are just too tough. Your heart is ready to go on strike. Which means, eventually, pulmonary hypertension can lead to heart failure. There’s no cure for pulmonary hypertension, as we’ve said, but the earlier it’s diagnosed, the easier it is to live with. Your heart needs all the help it can get. Primary pulmonary hypertension or idiopathic pulmonary hypertension (IPH): This rare type of the disease is not caused by any other disease or underlying condition, so there’s no known cause. Some people with primary pulmonary hypertension may have a gene that’s a risk factor for developing pulmonary hypertension. But in most people, there is no recognized cause. Secondary pulmonary hypertension: Much more common, secondary pulmonary hypertension is caused by another underlying condition. High blood pressure, as we know, is very common. According to the U.S. Centers for Disease Control and Prevention (CDC), one in every three American adults has high blood pressure, but only about half have their condition under control. Not good! Because having high blood pressure is one of the risk factors for pulmonary hypertension – and we know that pulmonary hypertension is fatal if it’s not treated. Word of caution: If you have high blood pressure, get it under control and save your life. As the CDC points out, other common underlying causes include pulmonary arterial hypertension from some types of congenital heart disease, connective tissue disease, coronary artery disease, liver disease (cirrhosis), blood clots to the lungs, and chronic lung diseases like emphysema. If you have any of these, your heart and lungs are already compromised, making you more susceptible to pulmonary hypertension. Who is at risk for pulmonary hypertension? Anyone can develop either type of pulmonary hypertension. Older adults are more likely to have secondary pulmonary hypertension, and young people are more likely to have primary pulmonary hypertension, which also happens to be more common in women than men. Generally, pulmonary hypertension is more common among women, non-Hispanic blacks, and people aged 75 or older. As with many conditions, another risk factor is a family history of the disease or faulty genetics. Some genes could be associated with primary pulmonary hypertension. These genes may cause an overgrowth of cells in the tiny arteries of the lungs. This makes these arteries even narrower, contributing to higher pressure. The symptoms of pulmonary hypertension during the first stage of the disease are common to many other medical conditions – symptoms like fatigue and difficulty breathing. This often means a delay in diagnosis until the more severe symptoms occur. The more serious signs are dizziness, chest pain, ankle swelling and feeling your heart race or pound with scary palpitations. These later symptoms indicate that your body is not circulating enough oxygen-filled blood from your lungs – which is a definite health problem that needs treatment. If these symptoms are reoccurring, see your doctor. 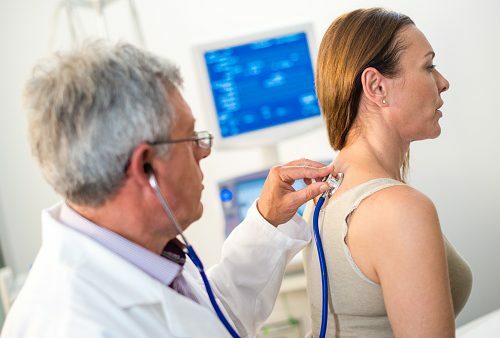 Early diagnosis goes a long was in treating pulmonary hypertension with a variety of methods: pills, inhaled medication, medicine to reduce swelling in your feet (diuretics), medicine given through the veins under your skin, and oxygen. Sometimes lung transplants are performed. Diagnosis of pulmonary hypertension is done through either blood tests, chest x-rays, Doppler echocardiogram, transesophageal echocardiogram, right heart catheterization, pulmonary function test, perfusion lung scan, CT scan, MRI or open lung biopsy. These tests may be done in conjunction with one another in order to get a proper diagnosis of pulmonary hypertension. Treatment for pulmonary hypertension involves medications that aim to open up blood vessels, block calcium, thin the blood, promote urination and boost oxygen.